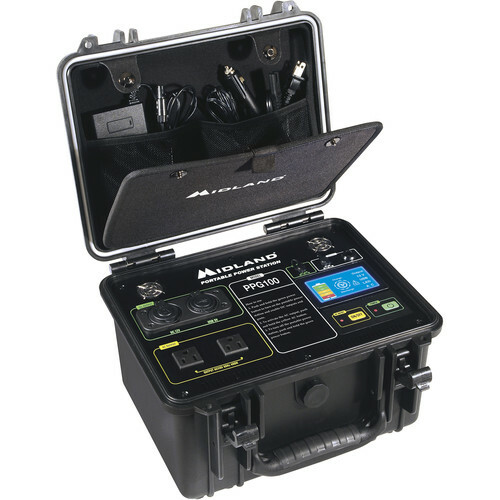 Power laptops, tablets, lights, TVs, tools, refrigerators, and more with the 950Wh Li-Ion Portable Power Station from Midland. An alternative to the noise, fumes and hassle of traditional backup generators, this unit uses a 950Wh lithium battery that can be charged from 110 VAC house current, 12 VDC vehicle battery power or solar panels. You can plug your electric or electronic equipment into two standard 110 VAC grounded wall plugs, two standard USB ports, or a 12 VDC vehicle cigarette lighter-style socket. Its AC output is 400 watts of pure-sine power. The unit will power a 0.4kWh/24-hour mini-fridge for up to 48 hours, a 45-watt LED TV for up to 18 hours, a 50-watt laptop for up to 16 hours, a 5-watt smartphone for 170 hours or a 3-watt LED bulb for 284 hours.